Richman Chemical Inc. (RCI) is celebrating its 30-year anniversary as the premier company in the custom chemical synthesis and manufacturing space. Over this time, RCI achieved preferred supplier status with many established and emerging life science and chemical-based clients as a reputable provider of custom manufacturing, product sourcing and project management services. The company helps its chemistry-focused clients meet pharmaceutical and chemical outsourcing requirements while accelerating product development and commercialization initiatives. RCI’s custom solutions focus includes cGMP manufacturing, pharmaceutical intermediates, complex multi-step syntheses, high value electronics chemistry and unusual chemistries. While specializing in “soup to nuts” custom offerings, it also developed an extremely important niche with respect to unit operation capabilities. Examples include distillation, drying, and particle size processing. Further, an experienced chemical sourcing department locates difficult-to-find chemical compounds- at any scale- for customers throughout the world. Ed Richman started RCI with the goal of helping companies use chemical resources more efficiently. In previous management positions at Celanese, Rohm and Haas, and National Starch and Chemical, he experienced first-hand the difficulties of insourcing and intricacies of outsourcing and parlayed that experience into a successful service company that continues steady growth. “30 years ago, custom manufacturing was a poorly understood and inefficiently executed segment of the chemical industry. I saw an opportunity to bring professional standards and partnership building methods to this market,” noted Dr. Ed Richman, owner and President. While the company started in the specialty chemicals and tolling markets, it now also serves higher value chemistry-centric markets such as life science, electronics, nanotechnology and diagnostics. Clients now run the gamut from virtual start-ups to Fortune 100 multi-nationals. With continuing year to year growth, additional project management and space resources were needed (see “RCI expands…” story here). With corporate headquarters now 50% larger in size, RCI is poised for continued growth and remains committed to meeting growing client expectations. “Having witnessed two-thirds of this historic milestone at Richman Chemical, I still marvel at what can be accomplished with premium human capital, a customer-focused business model, and the willingness to leverage both common sense and win-win propositions throughout our business,” commented Christopher Kulp, Executive Vice President. “The custom synthesis, manufacturing, and sourcing markets rely on developing strong relationships predicated on trust and a sustained track record of performance. We pride ourselves on providing just that, and our ability to service any and all customer bases requiring “custom AND chemistry” positions us well for the next several decades,” he added. To benefit from Richman Chemical’s 30+ years of expertise, contact Christopher Kulp, Executive Vice President, at (215) 628-2946 ext 13 or via email at clk@richmanchemical.com. For more information regarding our custom service offerings, CLICK HERE. 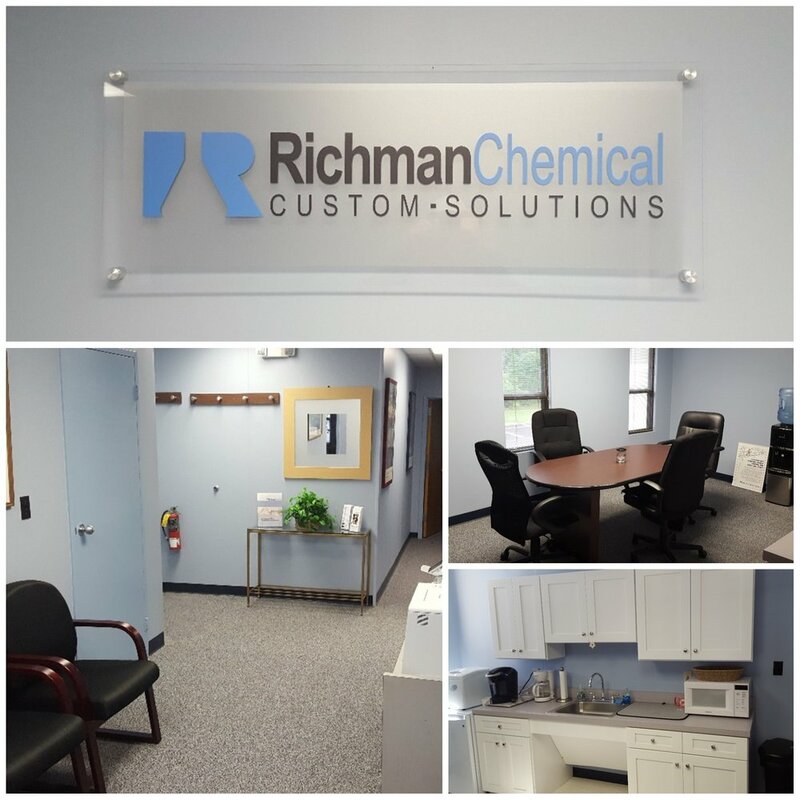 Richman Chemical Inc. (RCI) recently doubled the effective working space of its project management headquarters by adding several offices, along with a new conference room and office kitchen space. Building upon sustainable success, president and founder Ed Richman credits this significant expansion to the company’s commitment to excellent customer service, maintenance of long-term relationships, and investments in the RCI staff. “We have been in the same building for 27 years and this is our 4th expansion. It mirrors our relationships with our employees, clients and manufacturing partners, steady growth with time,” stated Dr. Ed Richman, owner and President. With over 30 years of expertise providing custom chemistry solutions (see “RCI: Celebrating 30 Years of Proven Expertise” story here), RCI’s substantial growth necessitated expansion of headquarters- located in Lower Gwynedd, Pennsylvania- during the fourth quarter of 2017. And, the expansion allowed for important personnel additions to the project management team. In this article, Kulp discusses the various capabilities of Richman Chemical, what sets the company apart from other providers, and how recent business growth has led to personnel and work space additions. Click Here to read more. Also known as DBHA, Dibenzylhydroxylamine has various applications but is used primarily as an antioxidant / antiyellowing agent... Click here to read more.